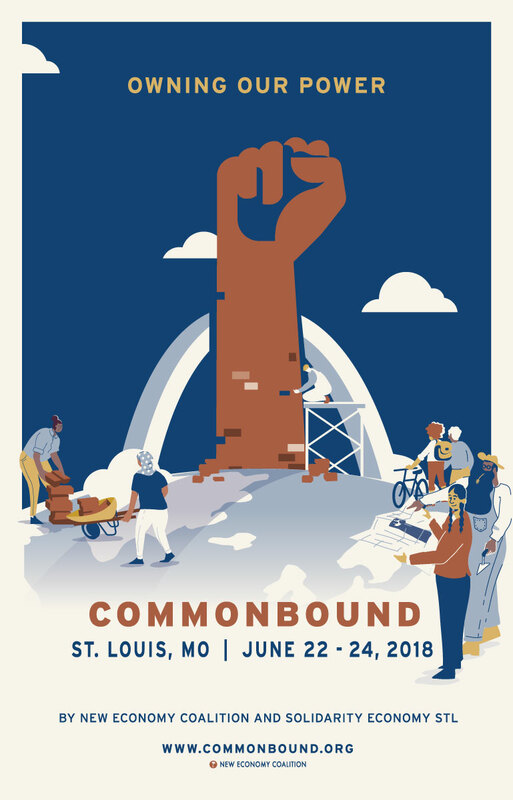 CommonBound is next month and we have a special offer for you: if you register for CommonBound before June 1, receive a FREE official event poster! Conference theme - Owning Our Power - is represented in the poster (pictured below) created by St. Louis-based artist Zach Otte with the input of conference co-hosts, Solidarity Economy St. Louis. It reflects the power being built - brick by brick - in America’s Gateway City by a community of organizers who are creating worker-owned businesses, timebanks, collectives and more in order to heal legacies of extraction, segregation and oppression. Posters will be available for pick-up in person at the conference location, Harris-Stowe State University in St Louis, starting on June 22nd! CommonBound has 10 incredible conference tracks led by 700+ changemakers who are building an economy that puts people and planet over profit. Will you be there? Here’s 5 reasons you should attend! PS: Registration for the conference is on a sliding scale. So, when you register at the Builderor Inventor level, it allows us to offer another full or partial scholarship to another attendee who needs it!